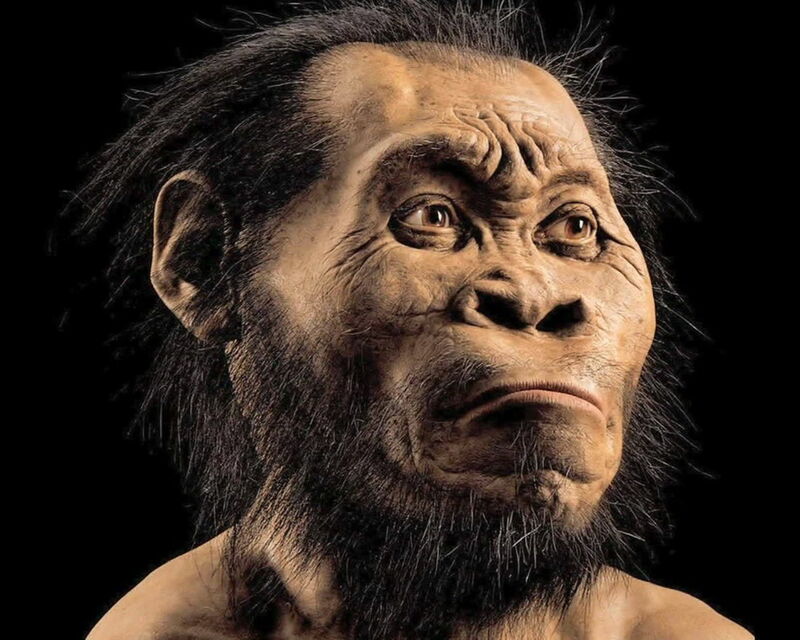 Homo naledi is a previously-unknown species of extinct hominin discovered within the Dinaledi Chamber of the Rising Star cave system, Cradle of Humankind, South Africa. This species is characterized by body mass and stature similar to small-bodied human populations but a small endocranial volume similar to australopiths. Cranial morphology of Homo nalediis unique, but most similar to early Homo species including Homo erectus, Homo habilis or Homo rudolfensis. While primitive, the dentition is generally small and simple in occlusal morphology. Homo naledihas humanlike manipulatory adaptations of the hand and wrist. It also exhibits a humanlike foot and lower limb. These humanlike aspects are contrasted in the postcrania with a more primitive or australopith-like trunk, shoulder, pelvis and proximal femur. Representing at least 15 individuals with most skeletal elements repeated multiple times, this is the largest assemblage of a single species of hominin yet discovered in Africa. Dinaledi skeletal specimens. The figure includes approximately all of the material incorporated in this diagnosis, including the holotype specimen, paratypes and referred material. These make up 737 partial or complete anatomical elements, many of which consist of several refitted specimens. Specimens not identified to element, such as non-diagnostic long bone or cranial fragments, and a subset of fragile specimens are not shown here. The 'skeleton' layout in the center of the photo is a composite of elements that represent multiple individuals. This view is foreshortened; the table upon which the bones are arranged is 120-cm wide for scale. Permission: Creative Commons Attribution 4.0 International license. Four views of the Homo naledi skull. 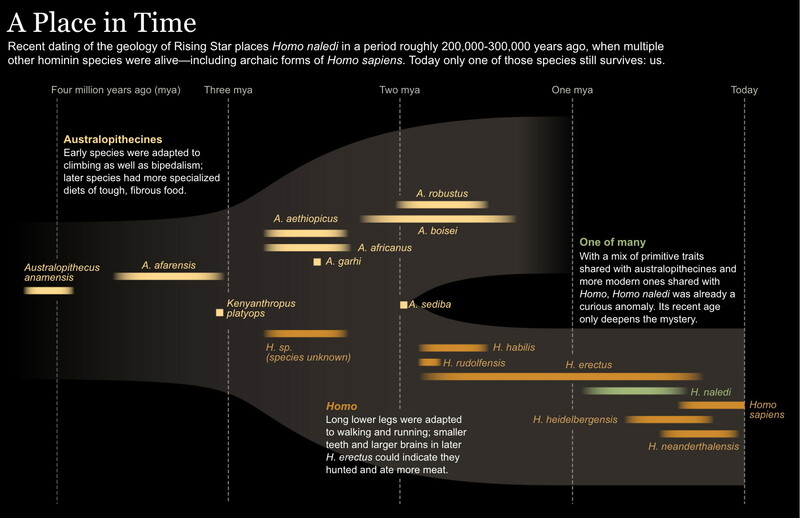 Hominin timeline. Note that Homo naledi turns out to be quite young in relative terms. Note also that Homo floresiensis has not been placed on this timeline. van den Bergh et al. 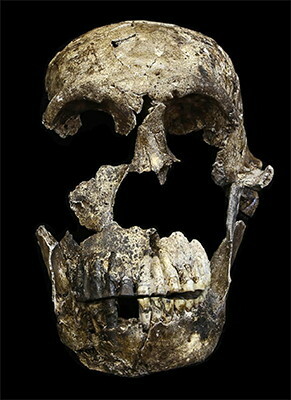 (2016) indicate that it may be a form of Homo erectus. Diagram illustrating the geological and taphonomic context and distribution of fossils, sediments and flowstones within the Dinaledi Chamber. The distribution of the different geological units and flowstones is shown together with the inferred distribution of fossil material. The fossils came into the cave at the time of the deposition of the unit 1, 2 & 3 sediments via the chamber entrance at top right. Unit 1 represents early sediments which contain only some rodent fossils. Unit 2 represents sediments attached to side wall by flow stone, i.e. 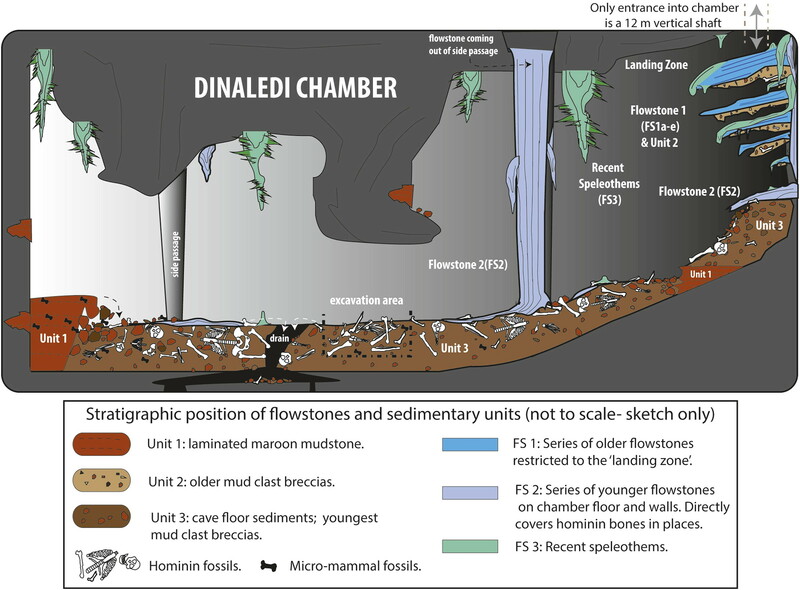 remnants of early deposits that do contain fossil bones of Homo naledi. Unit 3 represents rubble sediments containing most fossil bones. 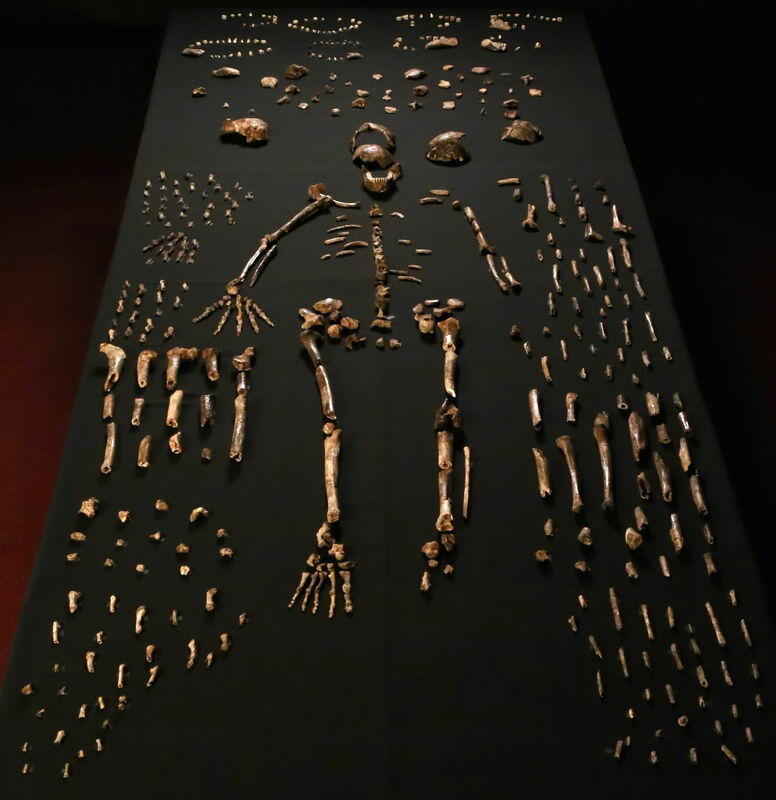 Berger and his colleagues announced in May 2017 that Rising Star has yielded a second chamber containing Homo naledi fossils, discovered during fieldwork in November 2013 by Steven Tucker and Rick Hunter, the same cavers who had found the first trove in a chamber called Dinaledi. 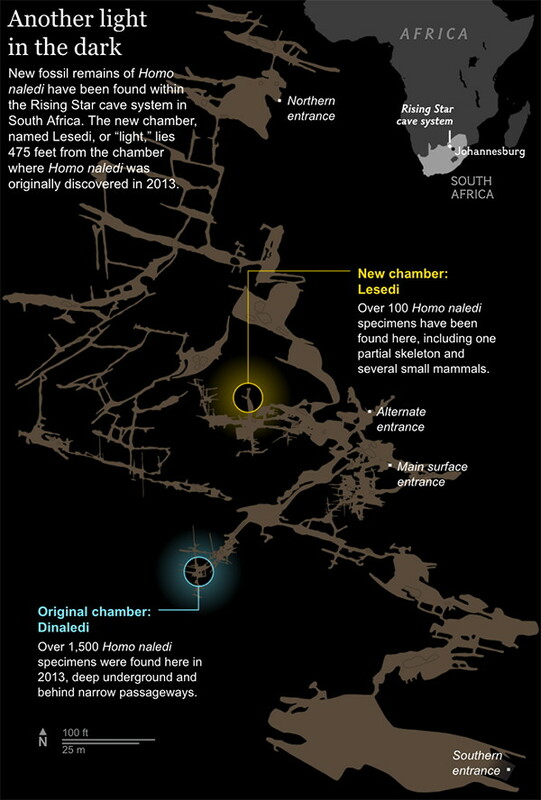 The second chamber, named Lesedi—for the Setswana word for “light”—is 475 feet, 145 metres, from the Dinaledi Chamber, which contained over 1 500 specimens of H. naledi. 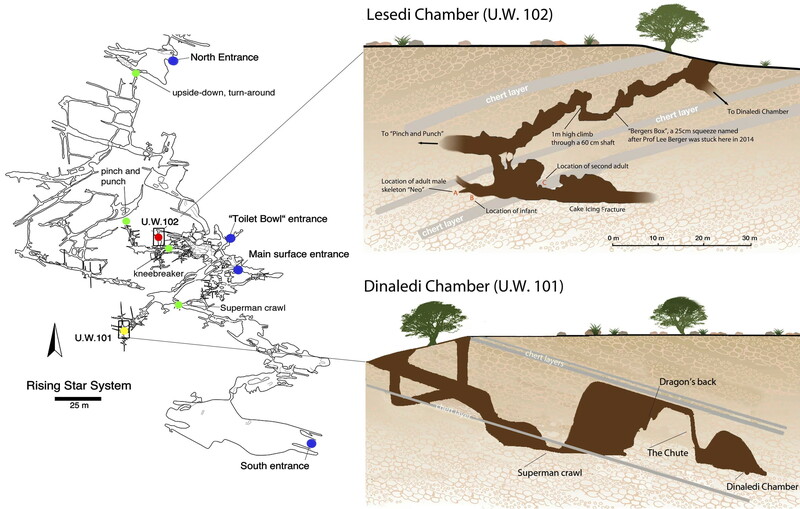 Much like the Dinaledi Chamber, which requires passing through a seven-inch-wide slot to enter, the Lesedi Chamber also poses unique challenges to archaeological excavations. Marina Elliott, the Wits exploration scientist who led excavations in both chambers, says that while Lesedi isn’t quite as hard to reach as Dinaledi, it’s harder to excavate. Neo was found in a narrow 'blind' alcove less than two feet wide. Map of the caverns of Dinaledi and Lesedi. 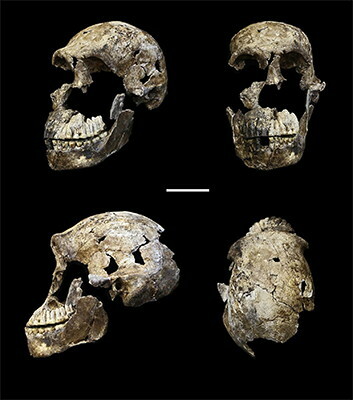 Replica crania of (left to right) Homo habilis (KNM-ER 1813, Koobi Fora, Kenya ∼1.8 million years old), an early Homo erectus (D2700, Dmanisi, Georgia ∼1.8 million years old) and Homo floresiensis (Liang Bua 1, Indonesia ∼20,000 years old) are compared with actual fragments of cranial material of Homo naledi that have been overlaid on a virtual reconstruction (far right; note some of the images of H. naledi material have been reversed). In each case, the crania are labelled with the typical features of each species. 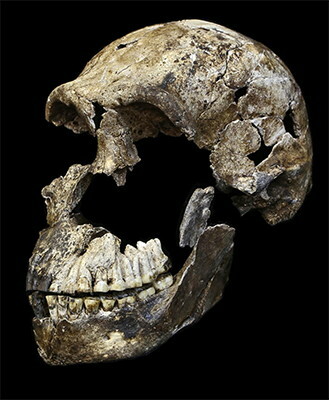 For example, while the adult brain volume of modern humans (Homo sapiens) is typically between 1000 and 1500 cubic centimetres (cc), H. habilis ranged from about 510 to >700 cc, H. erectus from about 550 to >1100 cc, H. floresiensis about 426 cc, and H. naledi between 466 and 560 cc. Furthermore, in modern humans, the occipital bone (at the back of the skull) is typically evenly rounded in profile, whereas in some early humans such as H. erectus, the upper and lower portions of the occipital are sharply angled to each other (i.e., ‘flexed’), and there is a strong ridge of bone running across the angulated region (called a transverse torus). Photo: Stringer, Chris (10 September 2015). 'The many mysteries of Homo naledi'. eLife 4: e10627. DOI:10.7554/eLife.10627. PMC: 4559885. ISSN 2050-084X.